It is Sunday and time for new challenge from Robyn's Fetish. 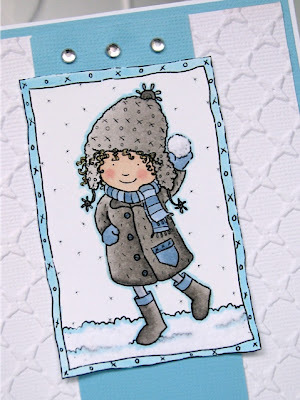 This time we invite you to make Winter Cards with Snow, that means you have to add something snowy on your card: glitter, snowflakes, snow pen, liquid applique etc. Our sponsor this week is Jelly Park with 2 images of the winner’s choice (except fund raiser images). У нас зараз -27 надворі, тому моя листівка сьогодні теж зимова та в холодних кольорах. Мені захотілося зробити дуже чисту й просту листівку. Просто до кінця не вийшло, але зате чисто. Листівку робила як дизайнер блогу Robyn's Fetish для нового завдання - зимові листівки зі снігом. Бажаю вам чудового настрою та дякую, що зазирнули! I used an image Snowball Girl kindly donated by the sponsor. I coloured it with copic markers and added white crushed velvet for the snow. Background paper was embossed. You have coloured her beautifully. Beautiful coloring and I like the layout design, too. 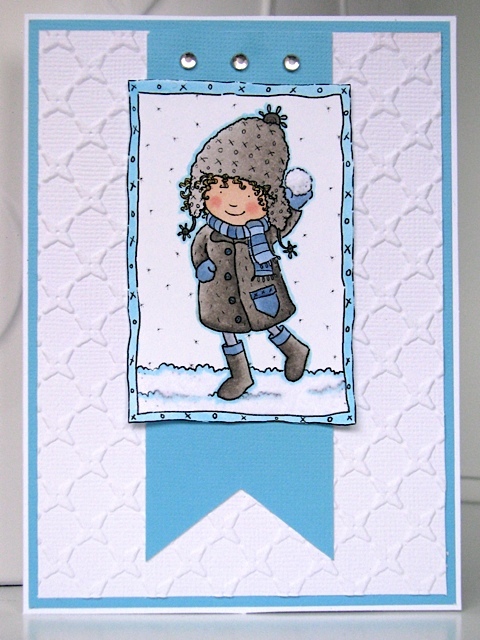 Love that embossed background and the blue center strip. Great job! Thank you! листівочка дісйно "морозна" і гарнюня! Cute card, really enjoy your embossed backing paper. Very pretty! Love the embossed background! Hi Lilia, How are you doing? How is your sweet baby? The embossing makes your image really pop. Awesome job. I love the embossed paper on your card. It's very pretty. The card is very pretty. Great Job!! Gorgeous card! Thanks for participating in our QKR STAMPEDE challenge!! Just love the layout and the wonderful embossing.